It is Christmas once again and everyone is looking forward to the sharing of good food, company and gifts. But with the knowledge of people stoking up with brand new goods and valuables, it also tempts the burglars and thieves to consider the rich pickings available from the unwary. Here is a little advice to help you beat the baddies this holiday season. There are many ‘theories’ and ‘myths’ in relation to a burglar, quite frankly the average burglar is in general a young person looking for easy access into your home with minimal effort, and a way which involves not disturbing the surroundings or most importantly WITHOUT being seen. Both an interesting and a worrying fact: Nearly a third of all burglaries are performed when the residents have left windows or doors unsecured when vacating their home. The More Deterants You Have, The Safer Your Home Is. In light of these facts, here are some security tips to keep your home safe and secure, and to keep burglars away. Fences – High fences are sometimes viewed as an essential tool to protect your home as they are ‘difficult to climb over’, however the use of relatively low fences can sometimes leave your household in view of neighbours and passersby who in theory can see any unusual activity taking place at your home and can report or take measures to prevent the incident. Shielding the home can work to a burglars advantage. Garden Security – Barbed wire is sometimes viewed a positive way of protection; however barbed wire is both unattractive, and can cause injury to innocent people. Therefore the introduction of simple items such as prickly bushes, or hedges can deter burglars from entering your home, and simple garden maintenance is all these items need. Outside Lighting -If a burglar was aiming to approach a house to burgle the property in a silent and sneaky way and was greeted with a security light being switched on, it is hard to believe the burglar would stick around to commit the crime. Locks And Bolt - Using pad locks on your garden shed or garage can further tighten security, also some sheds have windows, an addition of some iron bars on the inside of the window could go a long way in assisting the security of the shed. Another idea is little battery powered alarms for the shed; a burglar likes to come and go quietly, why not make it loud and uncomfortable. Why Help The Burglar - Wheelies bins which can be climbed on to gain access or assist in the burglars escape route should be stored slightly away from the house. Another common mistake is leaving garden tools or ladders around which can be used to gain access to your home. Also consider taking keys out of the doors in your house, burglars can sometimes reach through the letterbox and take the key away (Easy Access For Them). Lets All See The Potential Burglar – Make the burglar feel exposed when approaching your home. Lighting and low fences are the main points; however things such as drive or path lighting and a door step light can further make your household seem occupied. Pedal Cycles – If you own a pedal cycle be sure to try and lock it onto something bulky or fixed. That way it will be difficult to steal, and will be a less attractive item to attempt to steal too. Ultraviolet Marking - Ultraviolet marking your possessions with your house number and postcode can be very efficient in locating a home owner if contents are stolen. The Ultraviolet pen isn’t visible in normal light and can sometimes become very useful if items are found or confiscated. CCTV - CCTV is becoming more and more used by home owners as the cost of fitting the equipment is decreasing. Make the system obvious to criminals by using warning signs and logos around the property. That way any crime being planned or taking place will be recorded and criminals should think twice before attempting to burgle your home. Curtains - Curtains closed indicates the house is occupied. If you are away on a short or long break, why not give a trusty neighbour a key to open and close the curtains for you, you can then return the favour for them in their absence. (So outside your home is protected, why not look at our inside the home safety tips, click here to view this page). Using all these tips could help keep your household contents safe and provide further protection for your possessions. 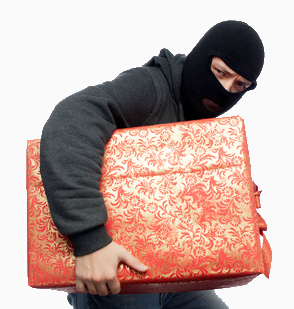 Most burglars will only enter a property if they’re certain that no one is home. Using a few simple tricks could mean the difference between returning to your lovely home or to a crime scene. Lighting – Lights or lamps on timers can convince any burglar someone is home. Having lights switch themselves on in areas of the house such as: Bedrooms, kitchen, living room and bathrooms can give the burglar a reaction that the house is occupied. Internal sounds – Plug in timers for the radio can make it sound like someone is home, radio stations with a lot of talking rather than music can be quite useful as it sounds like general conversation is taking place. Curtains – Curtains closed indicates the house is occupied. If you are away on a short or long break, why not give a trusty neighbour a key to open and close the curtains for you, you can then return the favour for them in their absence. Locks – Most household insurance companies require a certain level of security on your home, many insist on having things such as five-lever mortise locks on the front and back door. Securing windows, doors, patio doors and French windows can only be viewed as beneficial in protecting the home. Safes – Hiding belongings may seem extreme and a bit of an inconvenience, however having small safes around your home protecting things such as: Jewellery, important documents, car keys and money, can further protect your home. When fitting security systems ensure it is still possible to leave the property in the quickest possible way in the result of a fire. Always keep keys handy for any internal doors so your escape is not delayed. Be Wary Of ‘Doorstep Crooks’- Criminals can try and enter under false pretences pretending to be salesmen or meter readers. Then once they enter and are left unattended for a short period of time they can pick items laying around up and steel them. Elderly people, females, people targeted after bereavement and people living alone are the most frequent victims in these cases. Come Together With The Neighbours – Join forces with the neighbours and create schemes such as ‘neighbourhood watch’ to protect your area. Little stickers in the window with logos such as ‘home watch’ or ‘prevent crime’ or even ‘no cold callers’ can make your house look like a SAFE home and deter criminals. Alarms – A loud alarm system can scare a criminal off as he wants to be silent and not seen when committing the crime. An alarm system attracts attention to your house and alerts neighbours and passersby and most importantly scare away the criminal. Ultraviolet Marking – Ultraviolet marking your contents / possessions with your house number and postcode can be very efficient in locating a home owner if possessions are stolen. The Ultraviolet pen isn’t visible in normal light and can sometimes become very useful if items are found or confiscated.